Posting a picture of baby Lauren’s blistered foot on Facebook, the panicked mum explained her baby monitor was the culprit. “FYI those of you who use Owlet monitor,” she posted in her Facebook warning about the popular monitor she was using for her newborn. “Lauren cried all last night like screamed. I thought she was having a tummy ache. Come to find out her monitor was burning her foot. I have never been so mad and sick to my stomach. I just don’t want this to happen to anyone else. The company will hear from me tomorrow and reimburse me for damages. She will see Dr Penn tomorrow,” the distressed mum wrote. The hi-tech Owlet Baby Monitor – which Australian mums and dads may have bought via the Owlet site or Amazon – is worn on a baby’s foot, like a sock. 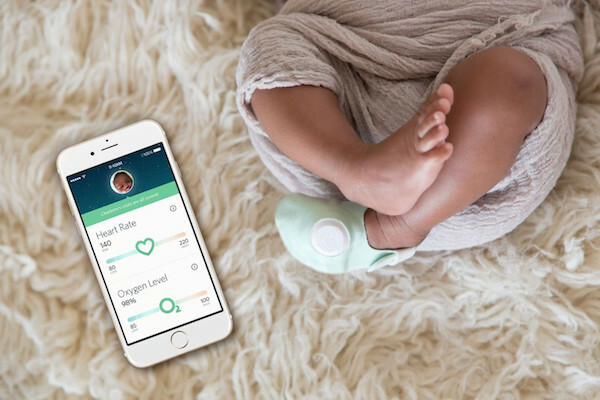 It retails for around $300 US, and promises to track a baby’s heart rate and oxygen levels, sending an alert to a parent’s smartphone via an app, if something seems amiss. The Owlet Monitor official website the company says burns from the unit are “very unlikely”. “In addition to all required regulatory testing and standards for product safety and product use with infants, we’ve rigorously challenged every aspect of the Owlet Baby Monitor through extensive in-office testing, over 10,000 hours of in-home testing, and additional laboratory and accuracy testing,” the Owlet folk say. Those who have used this product seem to agree – asserting via Facebook (in their hundreds!) that the blister is a friction blister and NOT a burn. Again – still very ouchy and not what you want for your precious bundle! “It happened to my daughter. I changed it everyday. Cleaned them every other day & had correct placement. We did everything right. My daughter has sensitive skin & there is no warning for not using with sensitive skin,” Facebook user Wendy wrote. But many, many Owlet users or baby carers felt that Lauren might have a blister caused by friction – rather than heat – and it was due to the monitor accidentally being used the wrong way. “I’ve never had any experiences with it burning or getting too hot, but my daughter definitely had blisters multiple times from the sock,” Facebook follower Leora shared. “Just a little food for thought, I work in Neonatal Intensive Care Unit I and we rotate the site every 3 hours. Babies have very sensitive skin and with the movement they have it can cause a friction burn. Not blaming the parent but more education needs to be done when using products like this,” Facebook-er Kisha wrote. The Owlet site does warn of friction blisters – if the monitor is ill-fitting or improperly used – on the support pages of their website, saying vigilance is required because babies have such sensitive skin. “Blisters, although uncommon, are associated with the sizes 2 and 3 socks and can form on the side of the foot or near the pinky toe when the sock is too tight, incorrectly placed, or too small. Generally, these marks are seen in babies who are wearing a size 2 or 3 sock, but should be in the next size up. The friction can be amplified if the baby kicks their feet often while wearing the sock,” the company says. If you’re using this monitor, now would be a good time to brush up on how it fits your baby and ensure you are using it correctly, for optimal safety. Friction blisters seem to be a potential – and painful – issue with the smart sock. We hope baby Lauren’s feeling so much better – and hope that Whitney has recovered from the stress of her baby suffering this kind of discomfort. Have you had a similar experience with this product?